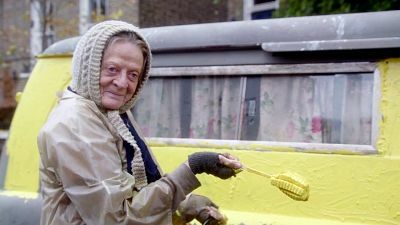 The British comedy-drama The Lady in the Van is based on Alan Bennett’s memoir about an eccentric elderly woman who “temporarily” parks her van in Mr. Bennett’s driveway and proceeds to live there for 15 years. And what begins as a begrudged favor becomes a relationship that will change both their lives. Directed by Nicholas Hytner (The History Boys), the film stars the magnificent Maggie Smith (The Prime of Miss Jean Brodie) as Miss Shepherd and Alex Jennings (Babel) as Alan Bennett. The Lady in the Van had its worldwide premiere at the 2015 Toronto International Film Festival. Smith first portrayed Miss Shepherd in 1999’s West End play of the same name (directed by Hytner), as well as in the 2009 BBC Radio 4 adaptation. The Blu-ray, DVD & Digital releases of the PG-13-rated movie include a Maggie Smith profile, making-of featurette, deleted scenes, visual effects piece and a commentary by Hytner.